A classroom at New York’s School of Visual Arts might seem a rare place for Allen Iverson to pop up, but that’s what happened eight years ago when a magazine cover image of the Hall of Fame guard flashed on the screen during an editorial photography session. As Clay Patrick McBride showed his class the image of Iverson, the 1999 Slam magazine shot featuring Iverson with full ‘fro in effect, a student jumped to his feet. “ ‘Oh, s—, you shot that picture? I had that on my wall in my bedroom,’ ” McBride recalled the student saying as he interrupted the class. It’s the type of reaction McBride said he gets whenever he brings up the cover. 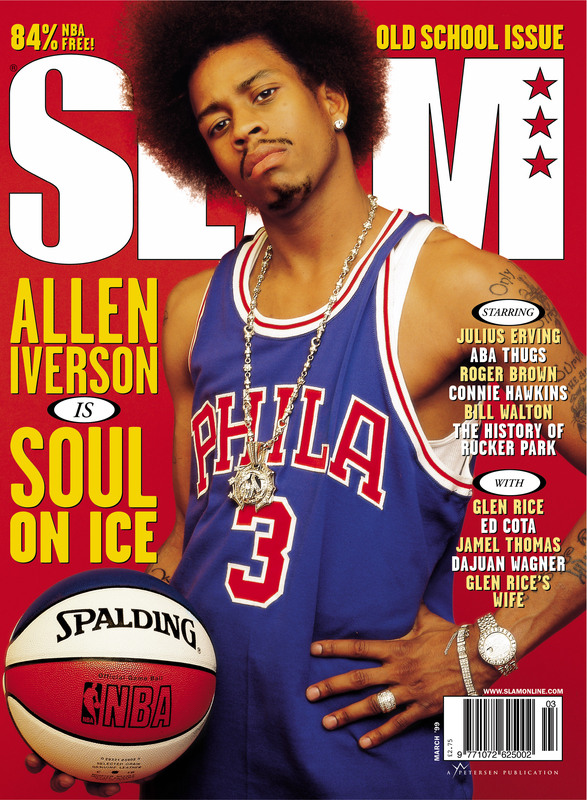 That cover image of Philadelphia 76ers star Iverson wearing a Mitchell & Ness throwback jersey alongside the caption “Allen Iverson is Soul on Ice” celebrates its 20th anniversary this month. It was issue No. 32 for Slam, the bimonthly publication launched in 1994 that provided a lens into the lives of up-and-coming and established basketball stars that few publications could match. Many of the cover images of Slam are classics. The March 1999 cover of Iverson is legend. The image was the idea of Tony Gervino, a current senior vice president at Tidal who, 20 years ago, was the top editor at Slam. It was shot during the 1998-99 NBA lockout, and the Slam staff was concerned about publishing an issue with no NBA. So the staff came up with publishing a throwback issue, and Gervino wanted the publication to feature Iverson in a pose mimicking an old photograph of Sixers legend Julius Erving, sporting his full Afro and holding an ABA ball. Although Slam was facing challenges getting credentialed to cover NBA games at the time, the publication was having little problem gaining access to NBA players. Knowing very little about Iverson, McBride began researching the 76ers point guard and found out about his arrest in high school, his standout career at Georgetown and the perception of him being rebellious once he reached the NBA. While Iverson had yet to be named an NBA All-Star at the time of the 1999 cover, his street cred in the league was unmatched. McBride’s favorite memory of the shoot? “Him showing up,” McBride said, laughing. The shoot, scheduled for noon kept getting pushed back, and for every hour that passed the photographer was concerned about whether Iverson would appear. Morris never had a doubt. Iverson finally showed up at midnight, pulling up in a stretch Hummer with an entourage that included family members and Que Gaskins, at the time the senior director of marketing at Reebok. As McBride finished the final stages of his prep, Iverson took a seat on the floor in front of a chair occupied by a woman in his traveling group. Her job was to take out Iverson’s braids and create a rare look for the eventual four-time NBA scoring champion. 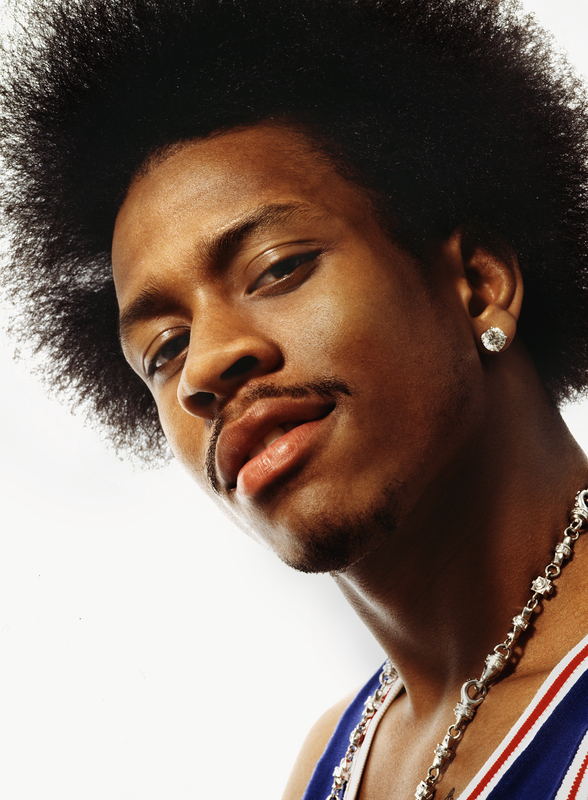 With his hair out (in the Erving-like ‘fro) and his throwback 76ers jersey on (made by Mitchell & Ness—years away from mass producing throwbacks), an iced-out Iverson was led to the two sets — one red background, one white — for the series of iconic photos. McBride was never given a time limit on his shoot, but he knew from experience not to waste any moments. 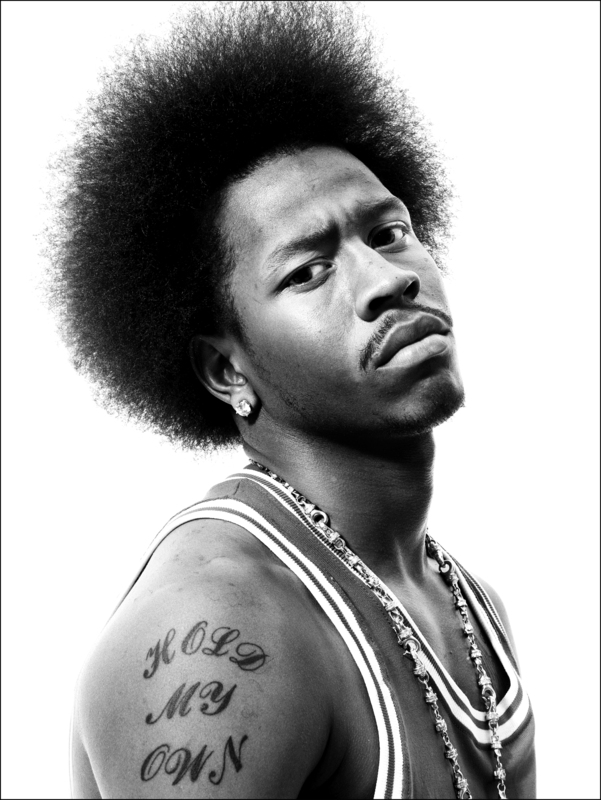 That wasn’t the case with Iverson, who spoke few words during the shoot but gave McBride everything he wanted. 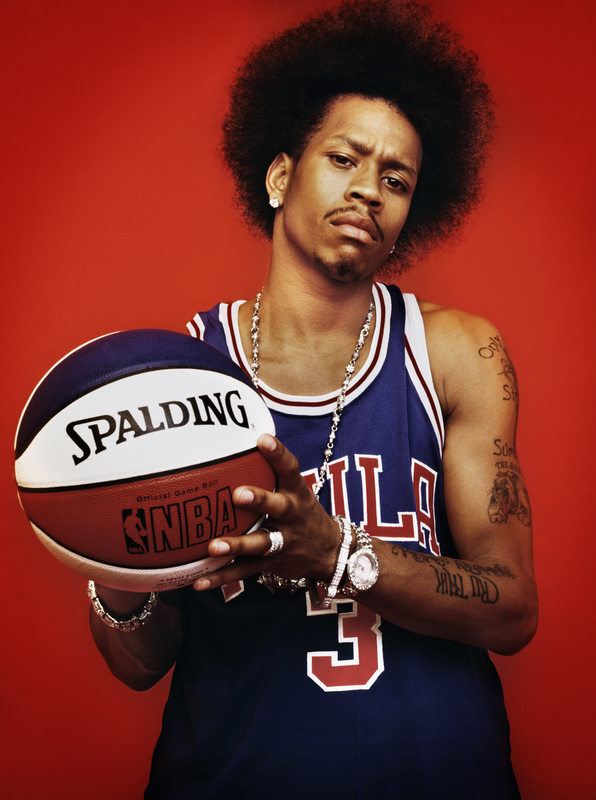 In some images (including the cover), Iverson posed in the throwback jersey, holding an ABA-style red, white and blue basketball. 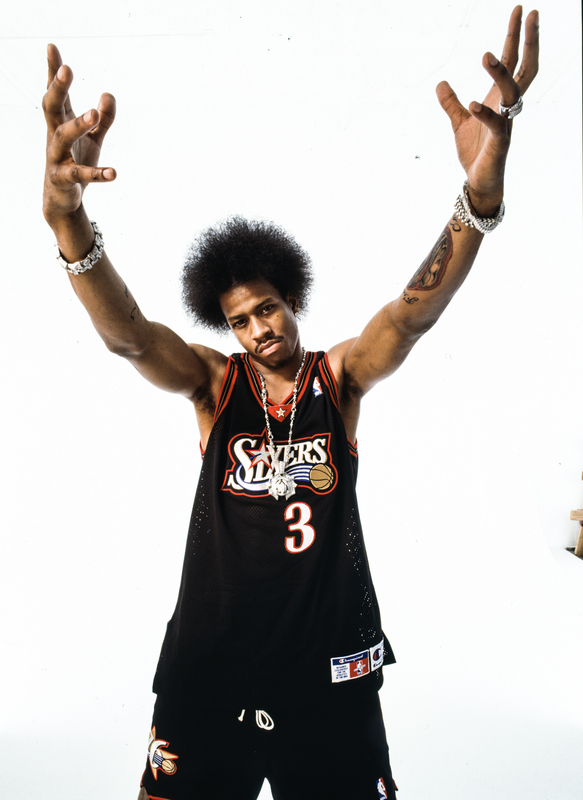 Other images included Iverson in his 1999 Sixers jersey making a series of hand gestures. After the shoot, which McBride said lasted about 25 minutes, the Slam editors were eager to get back to the office to see what they had to work with. 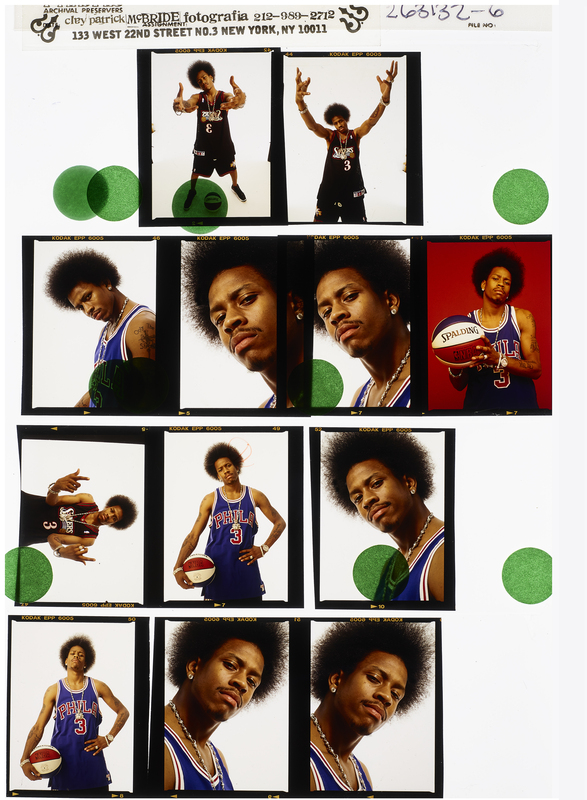 The shoot captured the very essence of Iverson, who, despite facing image issues that went back to his days in high school, always managed to maintain a sense of authenticity that’s difficult to find in players today. Iverson and other NBA players placed their trust in Slam. Slam, in return, delivered a slice of life of the players that was genuine. The principals from that photo shoot are still connected. Slam is a sponsor of the Allen Iverson Roundball Classic, a high school all-star game that will be played in Souderton, Pennsylvania, next month. One of the images used to promote the classic is from the “Soul on Ice” shoot. That cover was so memorable that Slam attempted to replicate it with Joel Embiid two years ago. The Iverson shoot may have indeed accelerated McBride’s career, but he looks back on the images and thinks about what he could have done differently. Over the course of his career, McBride has shot memorable images of Kobe Bryant holding a black snake (Slam) and Jay-Z as President Carter in an Oval Office setting, featuring Kanye West, LeBron James and Foxy Brown (XXL) and came up with the concept of Nas posing as a media assassin holding up burning books (XXL). Yet the Iverson “Soul on Ice” cover is still the one that resonates most with people. “When I hear people acknowledge that cover, that’s special to me,” McBride said. “We drove down to Philadelphia for a shoot with a guy that, at the time, I didn’t know a lot about, and now that picture is celebrated.